This is a new area of the UA 322 web site on which we will post photos and updates or short stories of UA 322 members and their families serving in the military. If you or a member of your family would like to be included on this page please contact the union hall and supply the necessary information including a photo if you wish one posted here. At left is a picture of Jeffery Riggs Sr. with his son, Jeffery Riggs Jr. after being commissioned as an Ensign in the US Navy. Jeffery graduated in May from Villanova University with a degree in Mechanical Engineering. He is now stationed in Pensacola, Florida for training as a Naval Pilot. 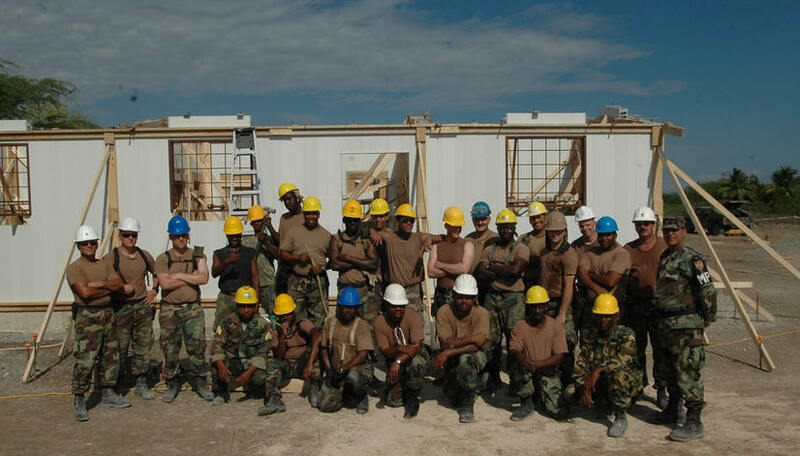 Brother Calvin Pierce submitted this photo of himself and his platoon in La Lista, Dominican Republic while on duty in April, 2006 with the Army National Guard as part of Operation New Horizons which is helping to build clinics using the RBS building systems. Operation New Horizons, or Nuevos Horizontes as it’s known among Spanish speaking participants, is an engineer humanitarian civic assistance exercise designed to give training to Guard, Reserve and active duty units in civilian construction or medical care services. Participating American troops build basic infrastructure (roads, bridges, schools, wells, etc.) and provide medical, dental and veterinary services.